Sometimes a genuine smile can really get under your skin. That certainly was the case for Kristen Casillas, who met her husband, Joel, nine years ago under rather blasé circumstances. He was working at Mexican restaurant El Compadre in Atascadero. She was working at a nearby coffee shop. Both were young, full of dreams, and just trying to make a few bucks. 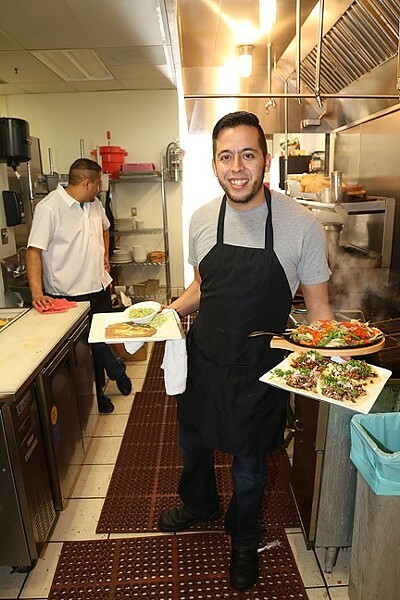 ORDER UP: Joel Casillas, co-owner of Órale Taqueria in downtown Paso Robles, shows off his serving skills with a range of Mexican delights. Was it the lust for life? The sincerity? The pearly whites? The pair went on a few dates before Kristen moved to San Diego for school. She knew she would be studying international business in Chile for a year, so a long-term love connection was unlikely. Then, there was the language barrier. Joel moved with his family from Mexico to the U.S. at the age of 17 in search of the American dream. You know the story. He went on to take ESL courses at Cuesta, always with the thought that he could create a new, more meaningful and prosperous life. 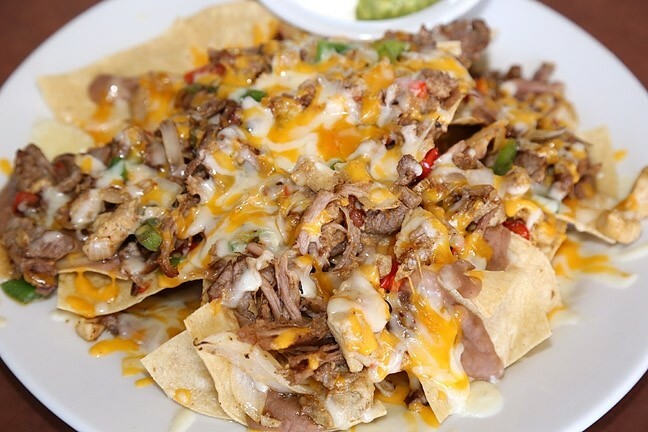 TRIO OF TASTES : Chicken, carnitas, and carne asada make for a savory, satisfying plate of nachos at Órale Taqueria. That first smile, however, never faded. The pair stayed in contact up through Kristen’s graduation and return to the Central Coast in 2010. Miraculously, Joel’s English had improved vastly and so had Kristen’s Spanish. Love grew. The couple married in 2011, a little more than a year after reuniting. Now, they’re proud owners of Órale Taqueria, downtown Paso Robles’ newest Mexican restaurant. This is the fertile growing ground where flavor is blooming. Clean and modern yet warm and authentic, the menu is a mix of both Kristen’s and Joel’s cultures. On a recent Tuesday afternoon, the place was packed to the gills with locals looking for a quick, casual bite—something you can’t always find in Paso. With a super fresh salsa bar, light-as-air chips, and expertly cooked carnitas, Órale has become a communal hangout for local business owners, tourists, wine tasters, and families. This is not the white-tablecloth experience you’ve come to expect from the ever-elevating Paso Robles culinary scene. 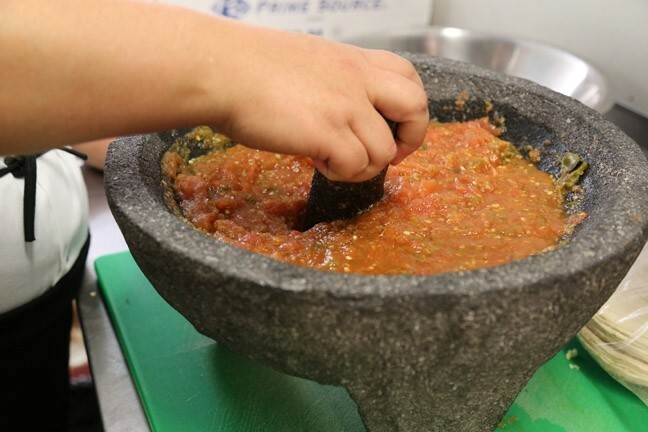 MEET ME AT THE SALSA BAR: A freshly made salsa bar makes for vibrant toppings at Órale Taqueria. A good example of this philosophy: Chef Javier Rodriguez’s addicting surf-and-turf burrito bowl, a bountiful mix of rice, beans, bell pepper, onion, killer carne asada, and juicy shrimp. The meal boasts all the flavors you’d associate with down-home Mexican grub paired with fresh, simple ingredients and zero lard. Kristen’s tip: order it “wet” with red or green sauce and guacamole or sour cream. You will not regret it. What makes a place feel warm and cozy? I’m not quite sure. Is it the from-scratch pico de gallo, thoughtful vegetarian-friendly options, local beer, or something more subtle? All I know is that Joel, 27, and Kristen, 29, are young, in love, and making delicious food magic that tastes and feels authentic and satisfying. It’s a tried-and-true family operation that Kristen hopes will make a mark on their 1-year-old daughter, Isabella. MEXIWOW! : Órale Taqueria is serving up tacos, burritos, and burrito bowls Monday through Friday from 10 a.m. to 9 p.m., Saturday from 11:30 a.m. to 9 p.m., and Sunday from 11:30 a.m. to 8 p.m. at 834 11th St. in downtown Paso Robles. For more information, call 369-2333 or go to oraletaqueria.com. “We love being at the restaurant and knowing our customers. Even if we could run the restaurant without being there, we wouldn’t want that,” she said. One thing’s for certain, Kristen and Joel have come a long, long way since exchanging a life-changing glance on an otherwise ordinary afternoon. The answer to that question is always a big, fat “no.” But hope—and a few good recipes—seem to have made all the difference. It’s a delicious love story, to be sure. Hayley Thomas believes in true love and perfectly cooked carnitas. You can reach her at hthomas@newtimesslo.com.